On Friday the 30th of November, trading on the euro closed down. The strengthening of USD was due in part to the anticipated meeting between the US President and the PRC Chairman during the G20 summit in Argentina. US President Trump tweeted that if negotiations reached a dead end, he would raise tariffs against China. This caused the rate to dip to 1.1306. 12:00 Eurozone: Markit manufacturing PMI (Nov). 12:30 UK: manufacturing PMI (Nov). 14:30 US: FOMC Member Clarida speaks. 16:00 US: FOMC Member Quarles speaks. 16:30 Canada: RBC manufacturing PMI (Nov). 17:15 US: FOMC Member Williams speaks. 17:45 US: manufacturing PMI (Nov). 18:00 US: ISM manufacturing (Nov). On Monday, trading on the dollar index opened lower. The euro rose against the dollar to 1.1373. Growth is sharp due to the fact that the US and China have agreed to suspend the trade war until the end of Q1 2019. The market reacted positively to this news. China has agreed to increase the volume of agricultural, energy, industrial, and other products from the US to reduce trade imbalances between the countries. In addition to negotiations, on Monday, oil went up by 5.5%, which had a positive effect on commodity currencies. 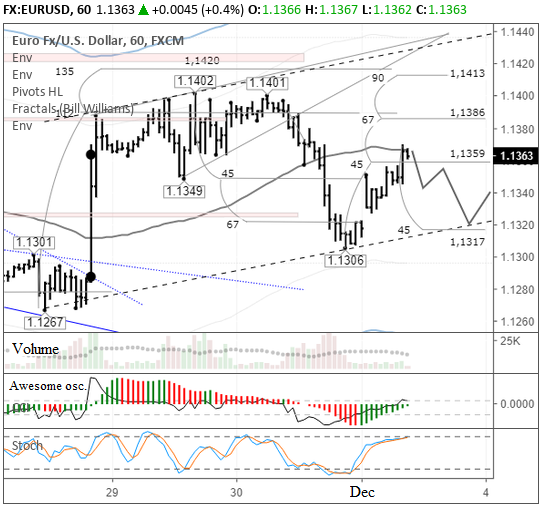 The price held at 1.1363, in actuality - 1.1374. According to the forecast, I'm waiting for the price to return to the bottom line of the channel at the 45th degree (1.1317). On Friday, there was a strong sell signal at this level, so when I did the review, I took into account that it would possibly defend the level of 1.1370. If you look at today's trade volumes, they are very low. As such, I do not see the possibility for any stop losses, and they are low for buy orders as well. It seems that sellers are setting a trap for buyers.